No-fuss function is the name of the game, and the Anon Raider Helmet is throwin' points up on the board like nobody's business. With an Endura-shell ABS construction, the Raider is extra durable and ding-resistant, too. It'll stay protecting your noggin, and looking good while doing it, season after season. Simple Fit capabilities allow you to quickly and easily remove your ear pads and liner, so you can fit your favorite beanie and goggles under your helmet, if that's your style. Passive ventilation moves hot air out, and draws fresh air in, so you don't overheat and your goggles don't fog. It's safe to say that this helmet is a real winner... and you will be, too, once it's yours. Endura-Shell ABS Construction – Endura-shell two-piece construction features an injection-molded ABS exterior for long-lasting durability and ding-resistant strength. Built for season after season of knock-around wear and tear, this is the pinnacle in reliable protection. 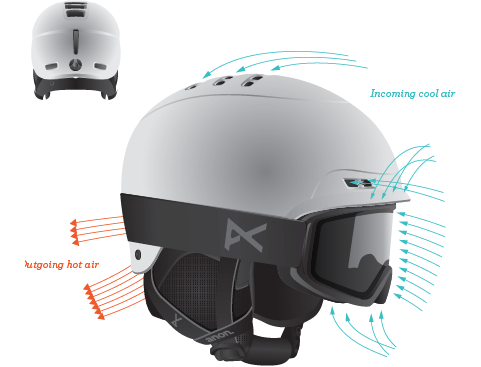 Passive Ventilation – Passive ventilation channels integrated into the helmet draw fresh air in the front and pull moisture out the back. These built-in channels help to keep goggles clear and aid in maintaining a balanced and comfortable climate all day long. Simple Fit – Easily removable ear pads and liners define Simple Fit featured in all Anon helmets, making every model easily convertible for riders who want to run a beanie and goggle under their lid. Strap-Stash – Exclusive to Anon, Strap-Stash is a customized EPS foam recess that allows you to comfortably run your goggle strap under the helmet for that skate-inspired, ultra-low-profile look, enhancing Anon's standard Simple Fit ready design.